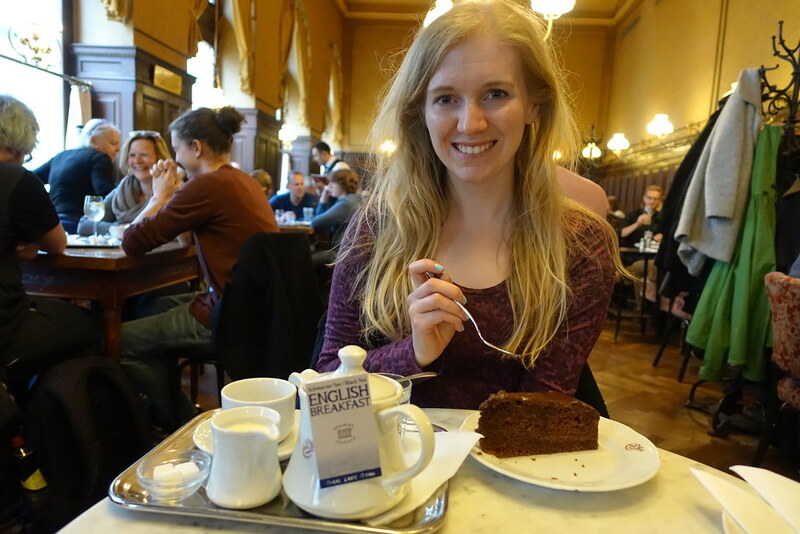 As an afternoon tea devotee, I’m lucky enough to have eaten a lot of cake in a lot of beautiful places. 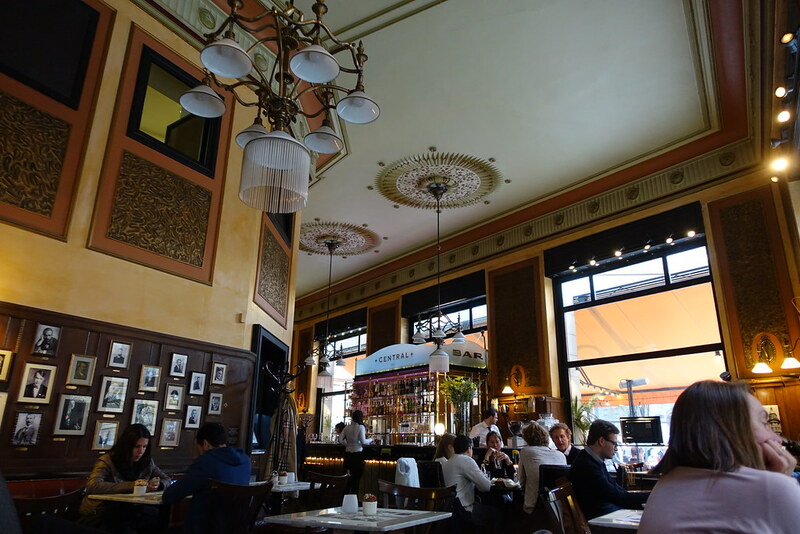 But none come close to the grand cafés of Vienna and Budapest, the respective capitals of Austria and Hungary. 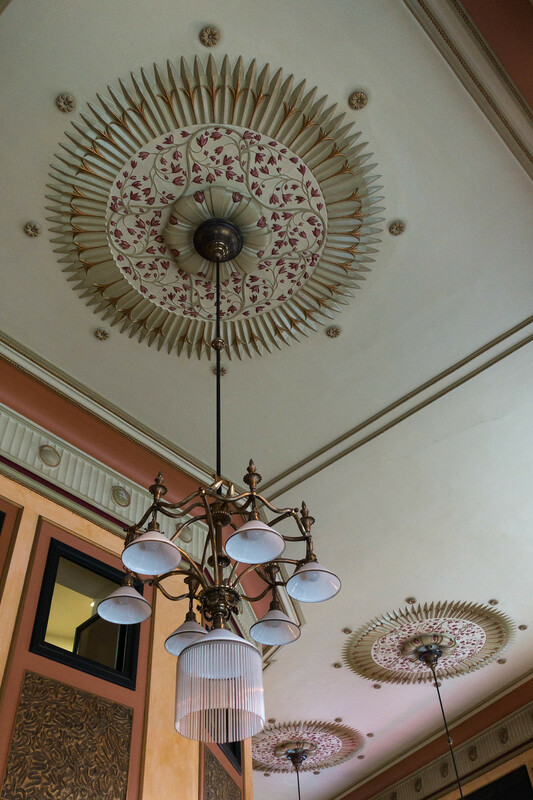 Established in the 1800s and frequented by the greatest artists and thinkers of their time, these cafés range from cosy libraries to bright, palatial halls. 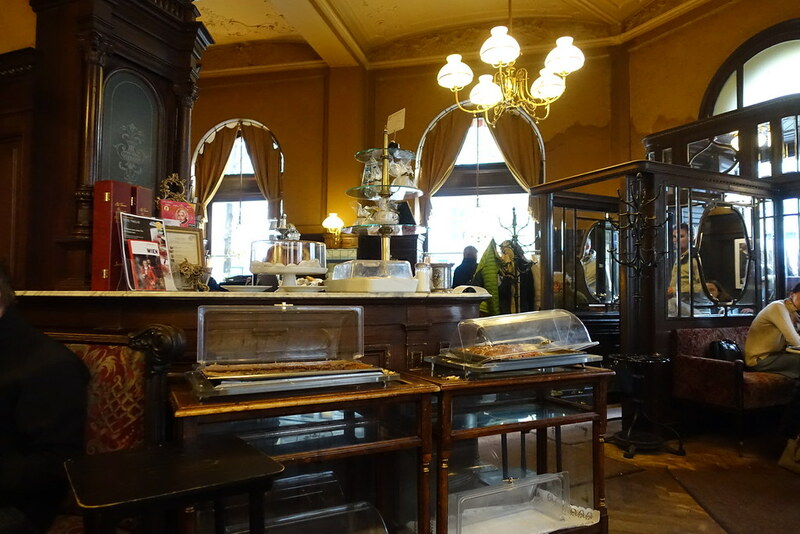 I enjoyed visiting these establishments so much that our Vienna to Budapest trip became a kind of café tour. 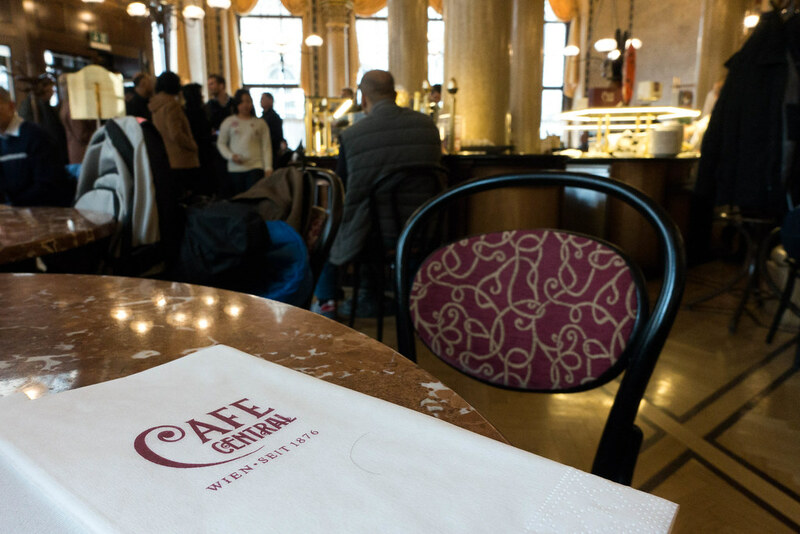 We began at Café Sperl, which dates back to 1880 and has all the hallmarks of a traditional Viennese coffee house: elegant high ceilings, marble tables, faded red velvet, and a rich history. 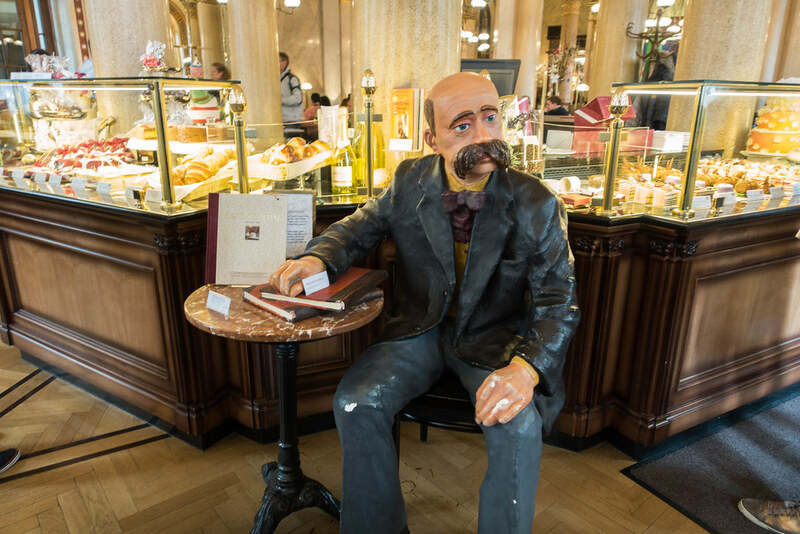 The Telegraph calls it the “world’s number one” Viennese café. Featuring a billiards table and a selection of newspapers mounted on handheld wooden poles (for easier reading, I assume), this coffee house has an insouciant atmosphere that seems to cater more for locals than tourists. 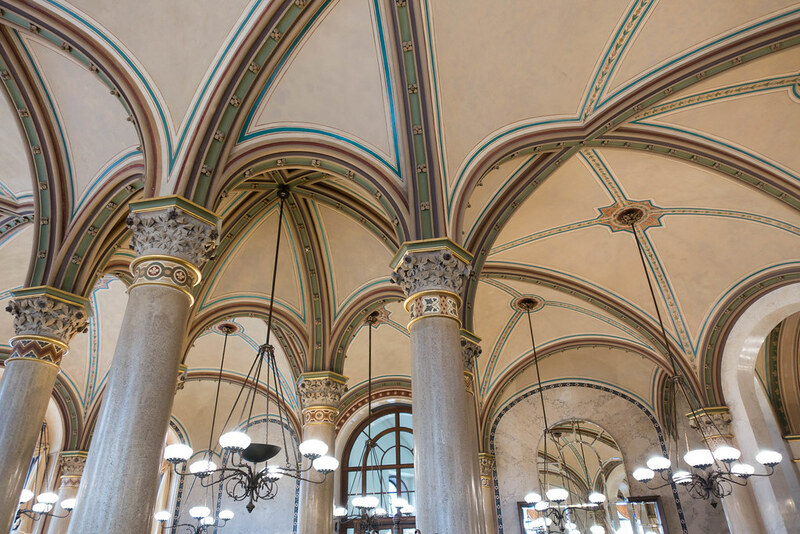 Café Central, established in 1876, is probably the most touristy restaurant in Vienna. 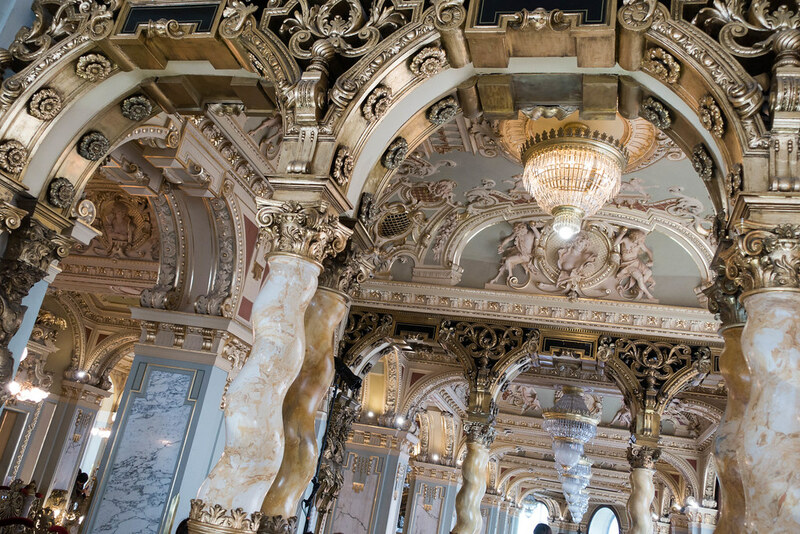 But there’s a good reason for that – the lofty vaulted ceiling, marble columns, gold trims and exquisite cake counter make it feel very special. It’s quite expensive to eat dinner here (Wiener schnitzel costs €20.90), but the option to have just a cake or a snack means that most tourists will still be able to afford a visit – as long as they’re willing to queue! Arriving at around 2pm, we only had to wait around five minutes to be shown to a table. I ordered the Viennese style soup and a glass of Kaiser Spritzer (white wine with sparkling water and elderberry), while Steve had the Cafe Central Toast (a toasted beef sandwich) and a beer. Both were pleasant. The service was refined and attentive, meaning we never felt rushed, despite the queue out the door of people waiting for a table. The beautiful room and pleasant service made this my favourite café in Vienna – I just wish I’d had chance to try one of the gorgeous-looking cakes! Centrál Kávéház (a.k.a. 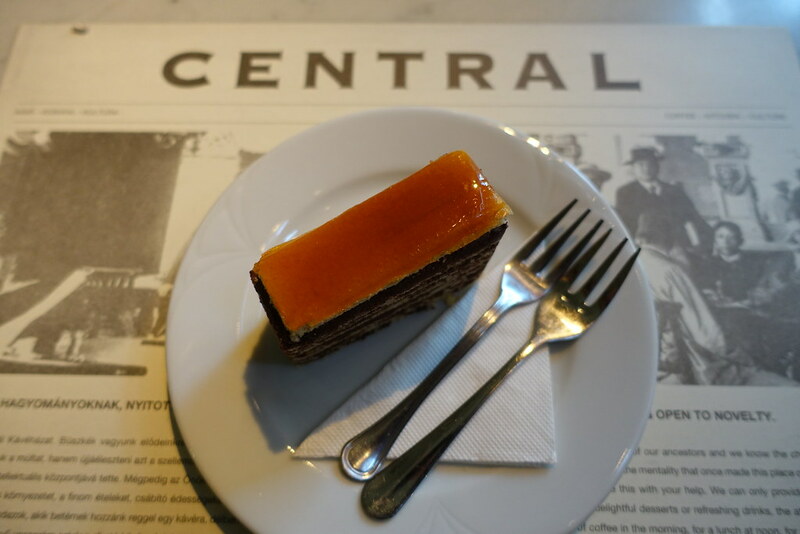 Central Café) has been plenty of things over its 130-year history, but in 1999 it was restored to how it was when it first opened. High ceilings, ornamental hanging lights, Persian rugs and leather seats create a space that’s airy, laidback and sophsticated. There’s soft classical music playing, warmly attentive service, and a pretend ‘newspaper’ to read providing insight into the cafe’s history. 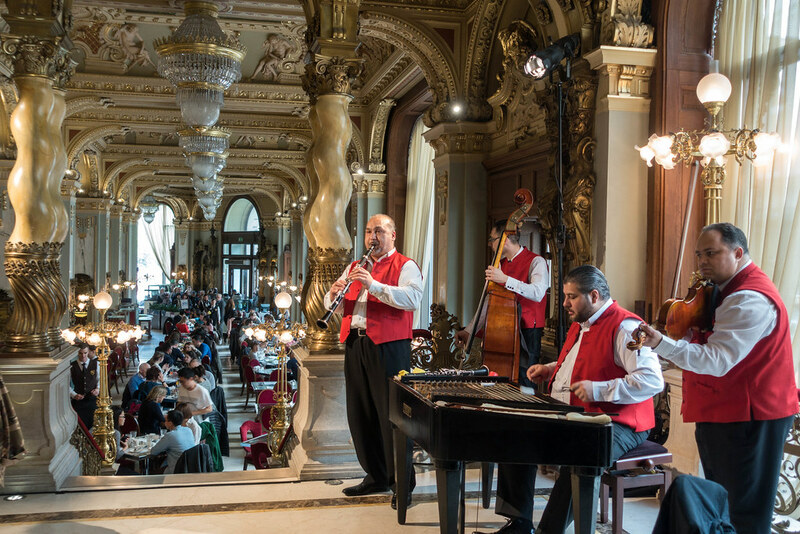 Its central location and affordable prices make it a great place for anyone to get a taste of classic Hungarian café culture. 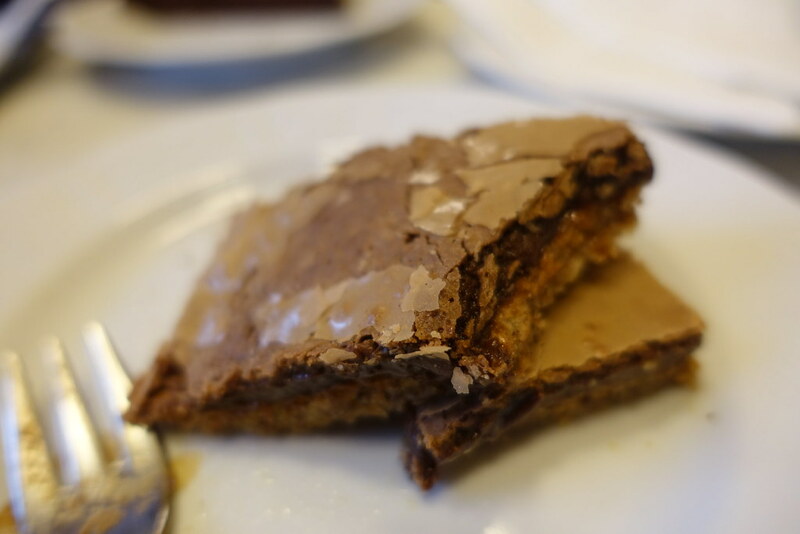 I had only an Opera cake – a tall, multi-layered slice of vanilla and chocolate sponge topped with hard caramel – but I would gladly have come back for dinner, had we had the chance! I saved the most spectacular until last. 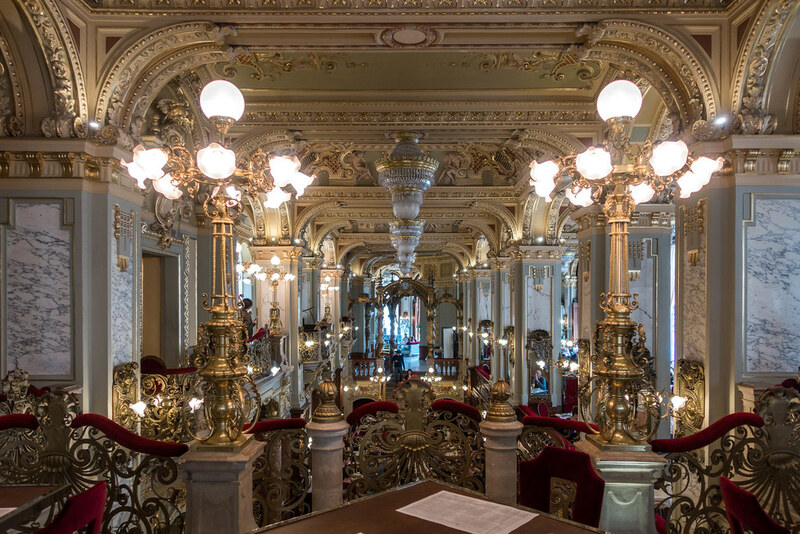 New York Kávéház in Budapest is more palace than café. Crystal chandeliers hang from its high ceilings, which display Renaissance-style paintings between golden cornicing. Rows upon rows of marbled columns, some square, some twisted like vines, create long corridors of opulence. Every lamp and balustrade is gold, and every seat red velvet. The grandeur is reduced somewhat by the large quantity of people they pack into this gilded space, but perhaps fortunately we were seated in the plainer section upstairs that is a lot more spaced out. This is also where the red-waistcoated band assembled to play a lively mix of classical and Hungarian gypsy music, which was very entertaining! 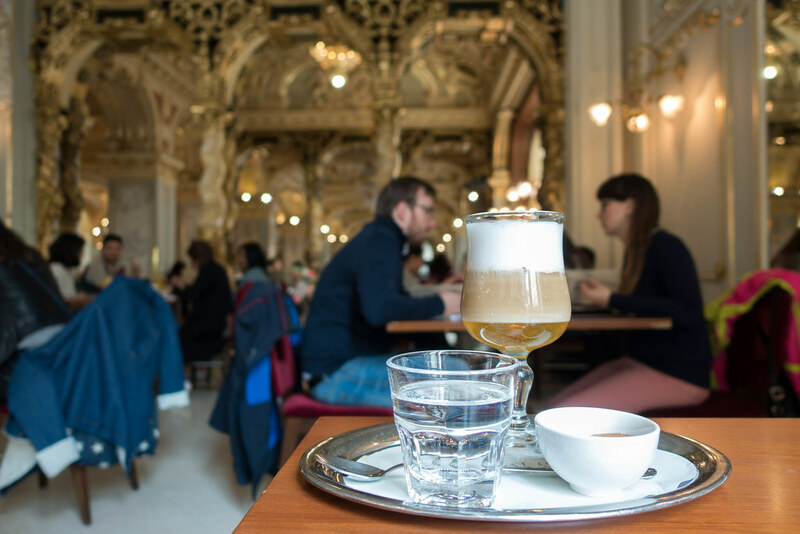 As you’d guess, you pay a higher price to drink and dine here – the self-professed “most beautiful café in the world” – than at other cafés in Hungary. A cappuccino will set you back €6, and a fresh orange juice €7. Our respective breakfasts, a tasty omelette packed with meat and vegetables, and miniature Hungarian sausages with mustard and horseradish, came to €9 each. But the service (up until struggling to get the bill) was good and, for the overall experience, I think you get your money’s worth. A final thing worth mentioning is the ‘Hungarian Coffee’ that Steve ordered at New York Kávéház (pictured above). Containing espresso, honey, Hungarian wine and spicy milkfoam, this concoction came in a large glass with its contents separated into distinct layers. The first sip tasted disappointingly like watery coffee, but, with a simple stir to combine the layers, it transformed into something closer to a hot toddy. The honey, chili and alcohol came to the fore to create a hot, sweet and spicy taste sensation in which the espresso was merely a background note. I would question the authenticity of this cocktail but, nevertheless, I could have downed this nectar with pleasure (and I hate coffee). If you only order one thing in New York Kávéház, I’d advise you to consider the Hungarian coffee! 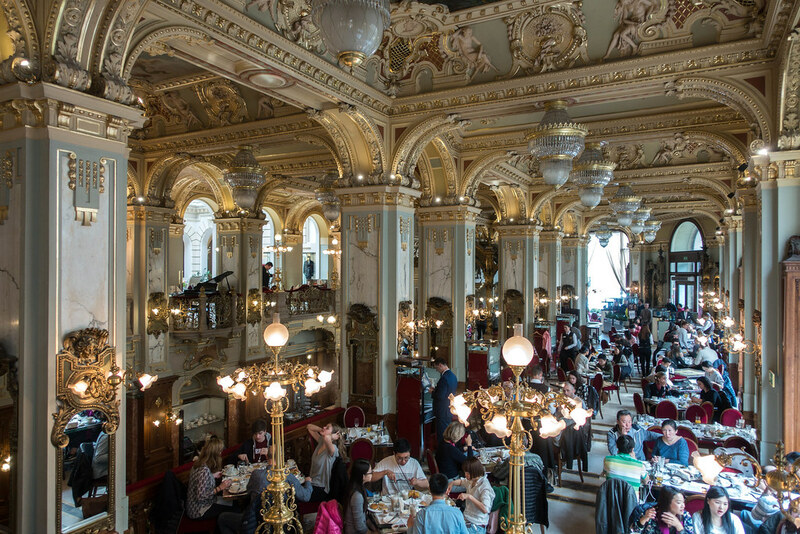 This is only a small selection of the many wonderful cafés in Vienna and Budapest. Do you have a favourite café in either of these cities? Let me know! 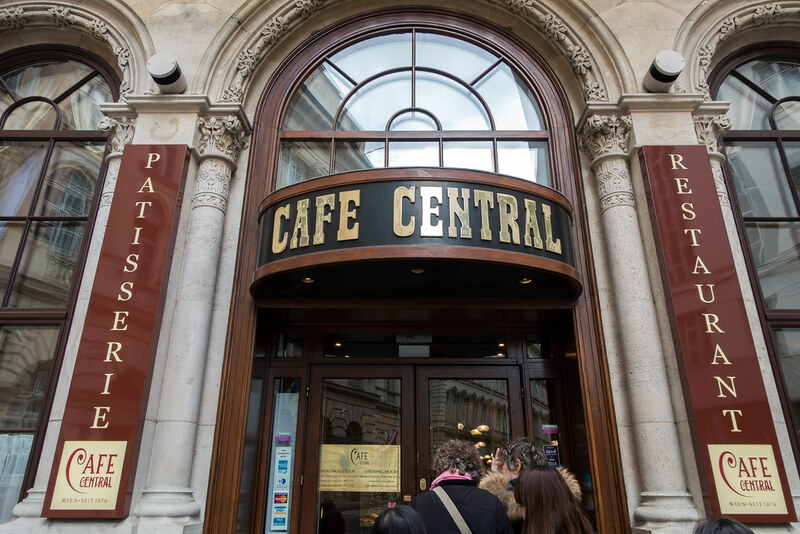 Posted in Central Europe, European cities, Food, Photography, Reviews, TravelTagged Austria, Budapest, Cafe Central, cafe sperl, Central Kavehaz, Hungary, New York Kavehaz, ViennaBookmark the permalink. You really know how to have a good time! ;D New York Kávéház looks ah-ma-zing!! One of the most beautiful interiors I’ve ever seen!! Me too, it was stunning! Yes, and there were yet more amazing cafes we didn’t get to try! At least ordering tea was simple – Steve often had 10 different types of coffee to choose from!